Right so here we are....we are currently at the roof stage of building and i thought now was good to start off the story. Unfortunately names of builders will be difficult as i can rarely remember mine, so me and the wife usually make up names. Where we left off from was having a plot of land in Chinagmai Muang, Padaed. A lovely quiet suburb near the Ping river about 7 mins to center of town. 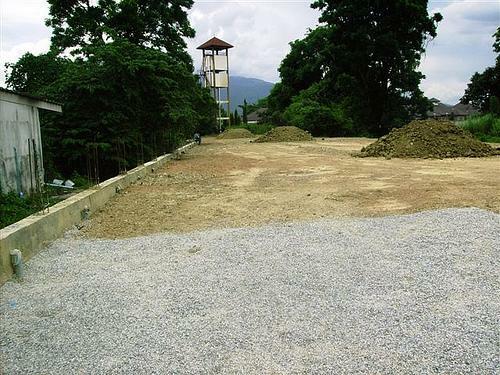 We have 1000 sqm of land over 2 plots split up as 600 and 400 sqm. The first plot is filled and the second isnt, this has now had 2 seasons of rain and is very well weathered. So now we had the land, we needed a house. We had compared the different avenues and in our hearts we wanted wood, but prefab wood construction was coming out at about 20,000 badt sqm, where as concrete was coming out at half that value. I am 27 and have not had a lot of opportunity to build up a mass fortune, so we were settling towards the concrete house. Then my wife read a Thai book about a Thai celebrity who had bought traditional wood houses and built a house from this. She started trawling the websites and we started to find places selling houses for 200,000 badt upto 600,000. It seemed like we had found a way to get exactly what we wanted, at a cost that was practical. We now felt positive we could build a house that we could live in and be happy. We decided after much trawling on the websites and little wood to be found in Chiangmai, to go to Phrae where we had met a man selling wood houses. We stayed there for a week looking at houses and had fond some really nice wood, at incredible attractive prices. But there was one house that gave us the goose bumps as we walked into it (no ghosts) an old styled house which was like a tardis. The wood was mostly TEAK and the house was mostly complete. The picture is amazingly deceptive, fistly because the house is on concrete pillars and they are about 1.80 m off the ground but secondly because this house is 12 x 10 m. We measured 2 bedrooms lounge and bathroom all good sizes. But the main ting was the internal space was amazing, it felt like our home and we both instantly took to it. So we went back to the hotel and me and the wife talked, and we came up with a decision. BUY< BUY<BUY! 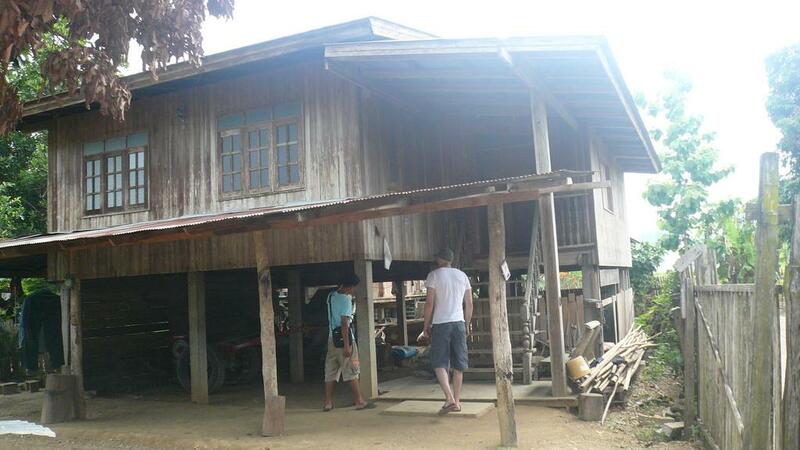 This house was without concrete poles but was in amazing condition, we offered 10,000 less knowing it was already good value, and the cost included delivery to chiangmai. 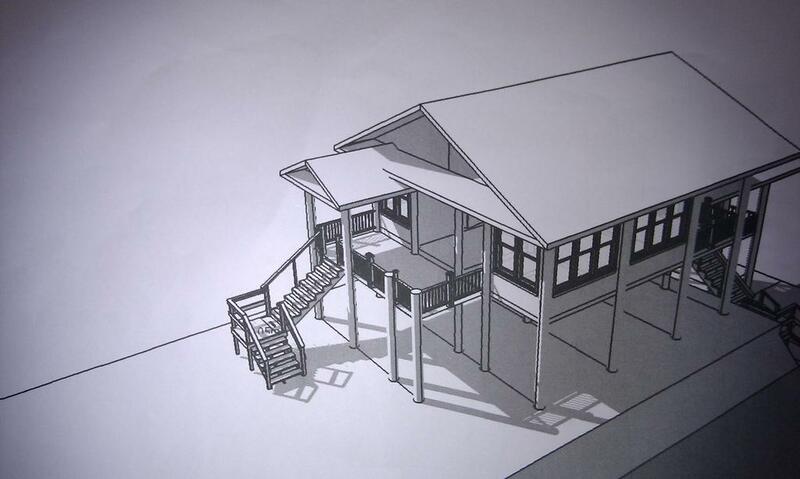 It was accepted and now the ball started to roll, we are building a house, ahhhhhhhhhhhhhhhhhhh! im hot its so hot today.......milk was a bad choice! good stuff ben. its about bloody time!!!! WE had labour from NAN come to look at the house and give us an estimate, firstly they said how nice the house was but it would be difficult to build (gulp). They said it would cost 245,000 for labour, i thought thats not bad at all. The builders trundled off to the land, and we got a phone call later that day. There is no water and no electric you have to pay for a hotel! I was surprised at this but more so their attitude, they had started to demand ridiculous things and i could see costs spiraling. We had a quick brainstorm and told them to leave, feeling uncomfortable about the way they had spoken. We then had a house being taken down but no one to build and no cost of what someone else might charge. I began to do what any good Englishman would do..... panic! After getting all the house onto a truck and travelling 180 km across Provinces at night, especially not having anyone to look after the wood was worrying! We paid the truck driver and his wife a lot to stay with it overnight and through out the day.....luckily we had friends come to the rescue. The builder who had previously tried to find wood in and around Chiangmai, only lived about 1km up the road, was asked to come and have a look and give us an estimate. This man was amazing, we felt more secure because we'd seen his work in other buildings, he lived not far away, he did everything right and gave in my estimation a more relevant cost that was slightly higher by about 30,000 B. The first thing we did was talk to the architect whose cost was 9,000 badt for this he would provide 3d sketches of ideas, the whole architectural drawings and support before building. sorry about the strange darkness around the pics. 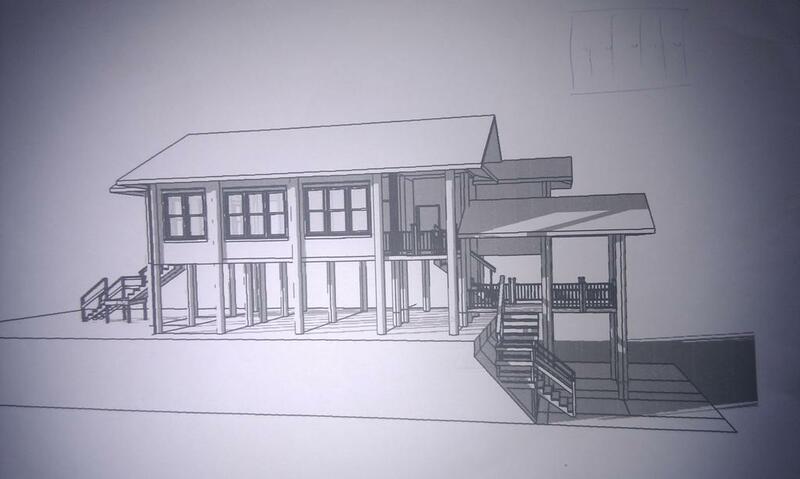 Have a wooden house, in Non Bor Sar via Non Han, Udon Thani which would be available.....understand price indication, difficult without inspection....see the range you were shopping in was200k to 600k...understood from your posts, trust correctly, you were interested in a second house. If you have done your shopping....perhaps you could forward the websites you considered most helpful...or any wholesale buyers for that matter. we have all the wood we need for now, thanks kindly! They are thai websites can you read thai if so i'll try to find and post. Thanks for your prompt reply....unfortunately unable to read Thai and added to that we are not very computer literate in this camp....any help would be a God send. How much did you pay on site for the house you bought....the broker may be helpful....but would be interested to hear from you by PM the price you paid for the house as it stood. Last edited by baby maker; 01-08-2010 at 04:24 PM. ^ If you are not able to read Thai and dont have someone you can trust to negotiate in speaking thai, I would say that you might find it hard as most brokers middle men do not speak English(none that i have met). You can still buy wood and there are turn key solutions for this thailanna homes is one of them but this is going to cost you a lot more. The price my wife paid for the house is just under 200,000 badt. Labour is going to cost 250,000 and materials depend on your situation. I hope this has helped!? Great to hear all is going ahead and looking forward to the continuation of your build. Last edited by baby maker; 03-08-2010 at 07:22 AM. Good luck and good building. Will follow the developments with interest. Like the design, give a feel of the traditional Thai style while having a roof over the entire structure. One idea though, drop the urinal and place a cloths washer and perhaps a dryer in it's place. Bangsean Chonburi, not as above! Howard Stern was given a new dressing room some years ago. He came on the radio and described it, saying it had both a sink and a urinal. He went on to say that he couldn't imagine why the management thought he would need both! Great project and bloody cheap I think. can i buy one and take it to cambodia? Looks like a great project, will be watching and following closely. many thanks to everyone who has given support, sorry i dont know how to quote in quote. but you know who you are!!!!!! Hi, thanks for the support and comments, the architect is thai and so thinks that if you are rich or a foreigner you have both urinal and toilet. 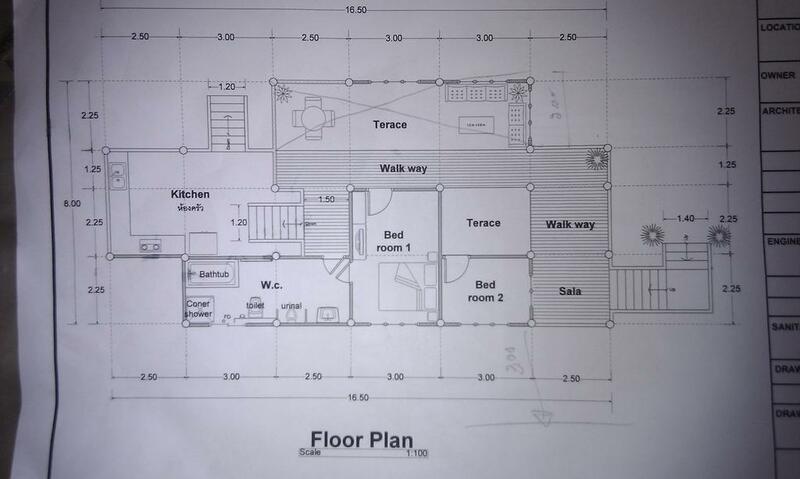 Trust me this is not the final plan, this is the first draft although you will notice the urinal pops up in all. We are also having a walk in shower, the bathroom will be all old wood with no concrete. We have done a few changes and i will show these as the build changes! One question, is the kitchen at a lower level than the walkway? I see the stairs down into the kitchen and wondered what the elevations were. This thread is absolutely fascinating and a joy to read. I look forward to the next set of pictures. Out of interest, why is bedroom two so much smaller? Is that the way the original house is? Will you use it as an office / TV room? Yes the kitchen is at a lower level then the rest of the house, this is so we can see views of Doi suthep, we have a viewing space at the end of the lounge for this. We have a tier on the land that slopes down from the infill 2.2 meters higher than the original land. here you can see the levels of the land and the tier in the house! hope this helps, many thanks for your interest and support! The bedroom was first going to be this size, because we have a 2 year old son. So we would have half size bedroom and then small play area for him so we could see him from the lounge. Obviously we also have 140 sqm of lower floor space as well, this is 3 meters high and the posts have been modified to make more space. I've been following the building threads for some time now. Wife and I hope to be able to retire back to Issan and tend our/her rubber trees. We'd like build a low cost house near them so I'm trying to get myself edumacated. 1. Most houses I've seen and reviewed in the threads involve pilings driven multiple meters into the ground and the house then build a few meters up on them. Now I'm used to seeing houses here built upon concrete slabs. So... if you want a one story house on ground level why not compact/raise and compact the ground and pour a supporting slab for the ground floor ? 2. I have the idea of buying enough teak or otherwise suitable wood from disassembled old wooden houses and assembling/using same to build upon a concrete slab. My point of reference is framed construction, not supporting pillars. Is this crazy or doable ? I'm injecting this question into this thread as the drawing of the house is much like what I am thinking about albeit on ground level. I am not a builder, and Whilst i am sure most things are possible, i would point out the problems i forsee from your question. If you buy Teak wood,(and it is Teak) you would be better to raise it for the example of air cooling and space. The only reason where this is not applicable is if you insulate in, and board over so that you can air con the building (or at least bedrooms). If you were to ask me it only makes sense if you cant get up the stairs on these, otherwise a bungalow wood house in Thailand seems counter intuitive (albeit i have seen them and stayed in them). Another point is termites, depending on how old the wood is they can eat into layers of the wood, but wont necessarily destroy it but make it look bad. You can inject chemical, you can treat the wood. You might find its an uphill struggle though, but i have no idea as i've never lived in a wood house on gound level for a long period of time! Pillars are interesting, wood poles are fantastic and when you see these and buy them and have them in your house, you feel good. Thats all i can provide unfortunately nothing factual all just an opinion! cheers for checking out the thread!